I found tonight's recipe on the Whole Foods site. We have never had grilled radishes before tonight. Wow. They taste like a peppery beet. A very nice surprise! The original recipe called for a dressing of lime juice. I decided to use olive oil and lemon juice because I was putting everything on a bed of Arugula. This was a perfect salad for a hot day. Prepare a grill for medium-heat cooking. Grill chicken until browned and cooked through, turning occasionally, about 12 minutes. Place onions and radishes in a grill basket or on a vegetable grilling screen to prevent them from falling though the grill grates. 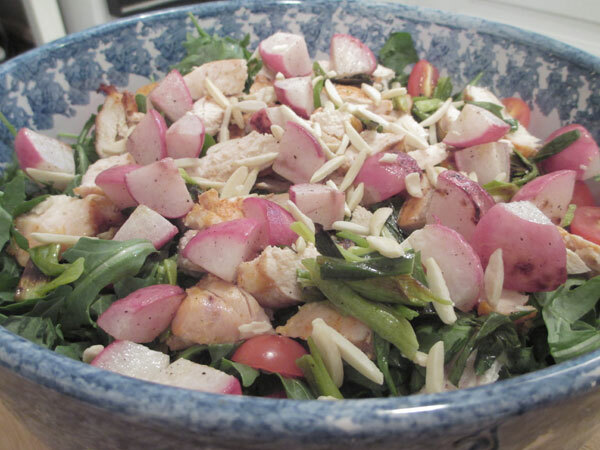 Grill, turning frequently, until browned and softened, about 4 minutes for green onions and 8 minutes for radishes. Allow chicken and vegetables to cool slightly, then dice the chicken and coarsely chop the onions and radishes. Place in a large bowl with the Arugula and top with almonds, mint, olive oil, lemon juice, salt and pepper, and toss. A Fig Tree Grows in Madison, Hopefully!!! Take Me Out To The Ballgame and New Pizza Place! Burgers and Grilled Corn? It Must Be Summer!